I am going to post the 2016 Census results before I post BI’s 2017 real estate sales statistics. Statistics Canada released the 2016 Census population and demographic data on May 3, 2017. The next day CBC News online posted an interactive graphic based on that data. CBC’s goal with the graphic was to illustrate a critical issue facing the nation - our aging population. We will begin to see this critical issue begin to have an impact on real estate sales, listings and prices within a decade. I posted the Powell River region demographics on June 21st. It would be worthwhile having both a quick look at PR’s Census results and the CBC interactive graphic before looking at BI’s own demographics. 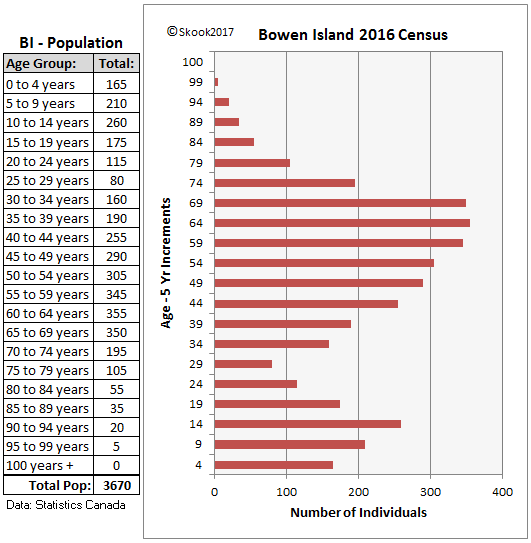 The Bowen Island population shows a strong “Baby Boomer” presence which as the CBC graphic illustrated will have a strong impact on the province and requires that all three levels of government (provincial, regional, and municipal) take steps to prepare for an increased demand on services. A plus for BI is the presence of children under the age of 14. On the island, the 0 to 14 age group stands at 17.3%, in the City of Powell River this age group represents 13.3% of the population and in the Powell River Regional District this age group falls to 10.9%. This shows BI has - at least until recently - be able to attract younger families to the island thus giving the island a more balanced population. Home prices have risen dramatically on the island in the last two years and this will impact its attractiveness to families with an average yearly income. However, islanders are exploring possibilities for increasing affordable housing stock. In regards to real estate, baby boomers on the island, throughout the province and across the nation will be putting their homes on the market - a critical issue if they are depending on home equity to support them in their latter years. This influx could see a sizeable drop in home prices as seniors compete to find buyers amongst a much smaller pool of younger age groups that follow them. But, I don’t think it will be an issue on Bowen if house prices were to fall.